LaStellina made by combining both the “press” and the “bleeding” method. LaStellina is a Rosato with personality and elegance. It is very slightly off-dry and intensely aromatic. This style of Rosato will complement any hot summer day on the patio or by the poolside.The cabernet franc adds some beautiful spice and herbal notes, Sangiovese bring with it those classic bing cherry notes while the Merlot provides a melange of red and dark fruit notes. The off-dry and highly aromatic qualities of this wine complement dishes that sport spice or piquant flavours – Thai and Indian dishes would be a great choice! This wine will also work beautifully with strong cheeses – be sure to search out some local favorites. 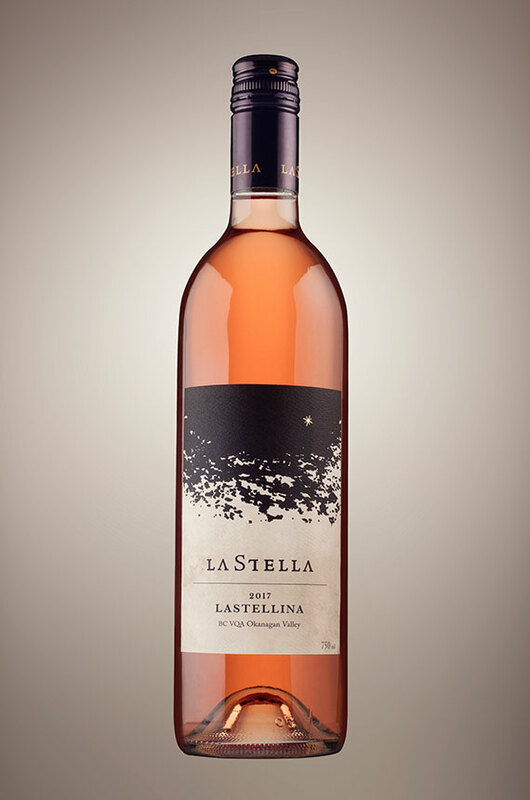 the pretty-in-pink LaStella Rosato 2017 blend of Cabernet Franc, Merlot, and Sangiovese brings boatloads of rhubarb, strawberries, and a hearty dash of white pepper to the glass.